Celebrate your determination and all the miles accumulated over the last few months. We will offer you a great variety show outdoors! There won't be walking or running at Maisonneuve Park. We invite you to come by walk, bike or race to complete your last kilometers. Let’s walk, cycle, run, roll and swim together to accumulate kilometers and funds for breast cancer research. Objective: to collectively cover 12,000 kilometers, the same distance as the province of Québec’s perimeter. It is possible to do a fundraiser and choose your objective during registration. MARK YOUR CALENDARS : SEPTEMBER 30, 2018! To celebrate the culmination of this great collective challenge, the Foundation will meet you on Sunday, September 30, in Montreal. A flamboyant fiesta awaits you! By registering for the Pink Tour, you will benefit from preferential rates to participate in Vélo Québec's activities. 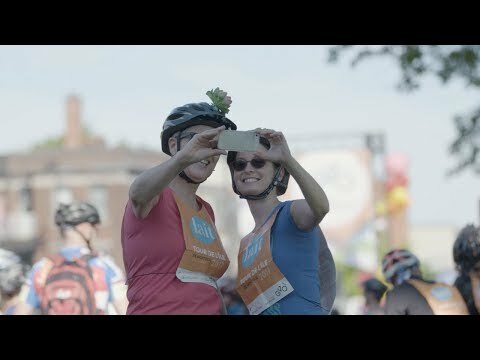 Whether it's the Tour la Nuit, the 1st of June, or the Tour de l’Île de Montréal, on June 3rd, the streets will belong to you, to discover the city in a different way. Want to push your limits? You can choose cycling circuits ranging between 50 and 150 km at the Laurentians Challenge (Morin-Heights) or the Eastern Townships Challenge (Bromont, montagne d’expériences). Even better, once you have completed these tours and challenges, you will already have accumulated some or all the kilometers for your chosen Pink Tour objective!